After watching Battle for Brooklyn Monday night, the panelists (including me) got to the inevitable discussion--especially regarding proposed rezonings--regarding the commonly accepted notion that only by building bigger will we get affordability trickling down. said public housing had been “starved” of federal support for years now, leaving the city with fewer ways of creating affordable housing. “Are we relying too heavily on the private sector?” she said. “There is no alternative.” Glen's phrase recalled the slogan of a politician with whom I doubt her boss Bill de Blasio identifies: former British Prime Minister Margaret Thatcher, a Conservative who believed in free markets. In CityLab, a return focus on gerrymandering high-unemployment zones to enable EB-5 loans; is NY Times fix for investor visas adequate? In a major CityLab article, published 4/12/19, Kriston Capps wrote The Hidden Horror of Hudson Yards Is How It Was Financed. It's not completely new, but it's news. It explains how developer Related Companies--using a common tactic--took advantage of loose federal rules to draw a zone of high unemployment snaking up to Harlem. That qualifies a project for a $500,000 threshold in the investor visa program, rather than the official $1 million requirement. The investors accept a lower interest rate because they want green cards for themselves and their families. Each $500,000 investment is supposed to create at least ten jobs--though that's dubious. There's something odd in the Pacific Park Brooklyn fact sheet/press kit (also embedded at bottom), which was apparently uploaded in January 2017: it claimed that construction had commenced on 615 Dean Street (B12) in November 2015 and on 664 Pacific Street (B15) in December 2015. See screenshot below. It's sloppy, especially since the document says "Below is the schedule of upcoming groundbreakings," while referring to six towers for which construction has purportedly commenced. Why mislead people? No solid evidence has appeared. I would note that misleadingly portraying progress was a feature in reporting by an investment packager (aka regional center) to immigrant investors, and those investors said they were in the dark regarding project progress. The latest Atlantic Yards/Pacific Park Construction Update (bottom), covering the two weeks beginning Monday, April 15, was circulated at 2:02 pm yesterday (late) by Empire State Development (ESD) after preparation by Greenland Forest City Partners. There's not much new from the previous update, but the document did offer an alert with very short notice: "Hand Excavation for Signal Relocation work scheduled to occur during overnight hours on 4/15 in a localized area in the Southern B8 footprint." That's just east of Carlton Avenue, near Pacific Street. Also new will be retail fit-out work starting at the B3 tower, 38 Sixth Avenue, and hand demolition of 700 Atlantic Avenue, a building that "bumps" into the western block of the railyard. What might full Atlantic Yards/Pacific Park buildout look like? More images surface. One major lingering question about Atlantic Yards/Pacific Park is the timetable: will it take until 2035 for full buildout, and how will developer Greenland Forest City Partners deliver the required 2,250 units of below-market, affordable housing by the 2025 deadline? Another has always been: what might it look like? Only four of 14 (or 15) towers have been built so far, as explained on my FAQ page, and with the image above right. See inset for completed buildings. No one has published the image below, which I cropped from a rendering, published by the developer and shown in full below right. It's a rather arresting image, because it's more forward-facing than any previous visual--as I explain below--even if it omits a tower. In other words, though it's from a hovercraft perspective rather than a street-level one, the hovercraft is not that high. A 4/1/19 Associated Press article, Tottenham Stadium follows US financing model, explains that the Tottenham Hotspur Stadium in north London will gain revenue not just from tickets but also from American-type sources, including "hospitality, broadcast, sponsorship, merchandising, concessions, advertising and digital rights." The Brooklyn Nets were last in attendance in the NBA, again, but this was a better year: they made the playoffs and turned a corner with their rebuild. Nets turnaround one of the NBA's richest stories, wrote USA Today's Jeff Zillgitt 4/11/19. The playoffs begin tonight in Philadelphia and, especially if Philly star Joel Embiid doesn't play, the Nets have a real chance. Here's a roundup via NetsDaily. The first game in Brooklyn is next Thursday, 4/18/19. The team's 2018-19 attendance averaged 14,941, according to ESPN, though late-season games showed far more interest. In 2017-18, the figure was 15,556 (though that was goosed by "home games" in Mexico City); in 2016-17, 15,429; in 2015-16, 15,125. That came after three seasons averaging over 17,000. Do note that all these figures represent official attendance, not actual gate count, which is significantly less. 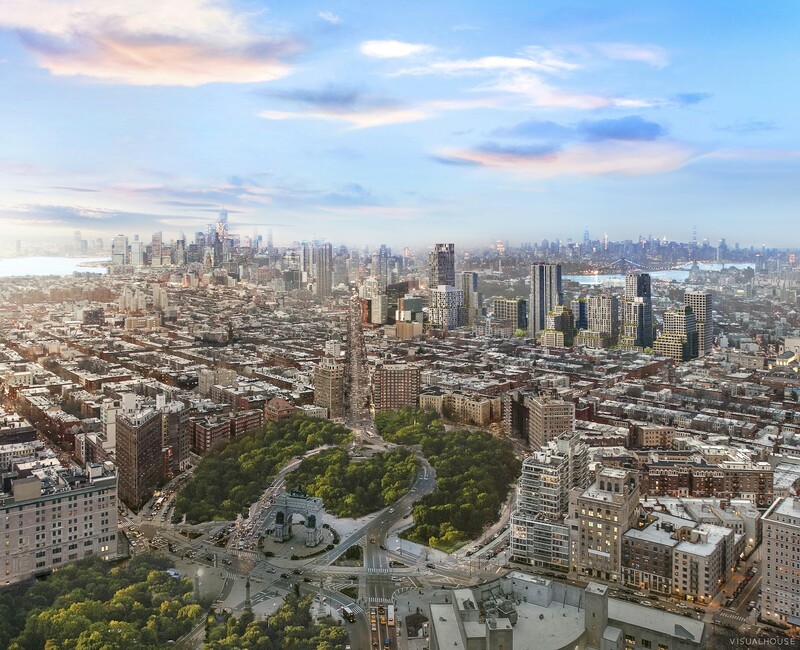 The next Atlantic Yards Project Quality of Life Meeting will be held on Tuesday, May 7, 2019. Please send Project-related questions, and suggested agenda items to atlanticyards@esd.ny.gov. What's the schedule for the next buildings: does it conform to the document I wrote about, suggesting three towers, one of them 100% affordable, will start in 2021 and 22 over the railyard? What's the timetable for the infrastructure needed in the railyard for vertical construction? How much of the foundations are done? This is an updated version of a post published 9/30/18. The film will be screened 4/15/19 (tickets: $5), and I'll be on a panel discussion afterward. Though limited in scope at the time (it's just 93 minutes) and now significantly overtaken by events, the film establishes for viewers an enduring taint on the project and its path to approval, with indelible scenes. My article last week for City Limits, Ever-Shifting Pacific Park Plan Highlights Uncertainty of Big Development Schemes, cited a December 2018 appraisal document that suggested that three towers over the railyard would start in 2021 and 2022, with a fourth projected to start in 2023. I expressed some skepticism in that article, as well as a follow-up post, regarding whether that ambitious timetable could be met, given the required infrastructure. Beyond that, as I explain below, another document, prepared by a construction consultant, adds more reason for skepticism. Not counting preliminary work--of which an unspecified fraction has been completed--the pre-construction infrastructure for the first three towers could take about three years. For the final three towers, the pre-construction infrastructure could take another three years.